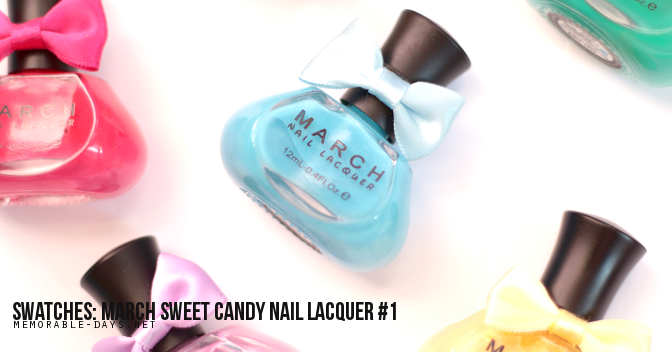 Swatches: March Sweet Candy Nail Lacquer #1 | Memorable Days : Beauty Blog - Korean Beauty, European, American Product Reviews. 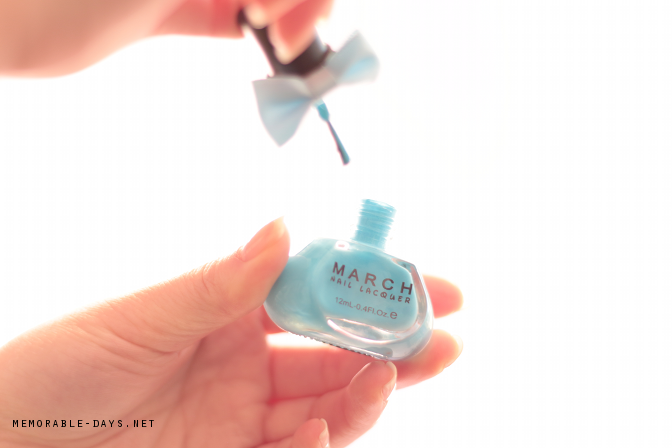 I hope you haven't forgotten about this adorable collection of the brand MARCH. I fell in love when I saw these for the first time on bornprettystore.com. 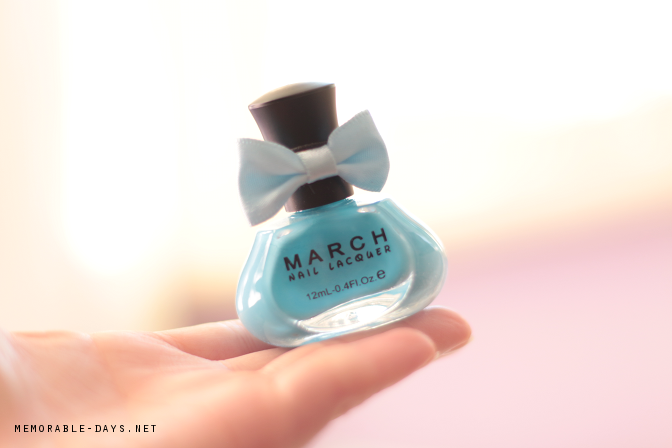 It's super adorable especially because of the adorable bow and the size of the nail polish bottle ^^ totally love it! Today I am swatching the color #1, which is a light blue color. 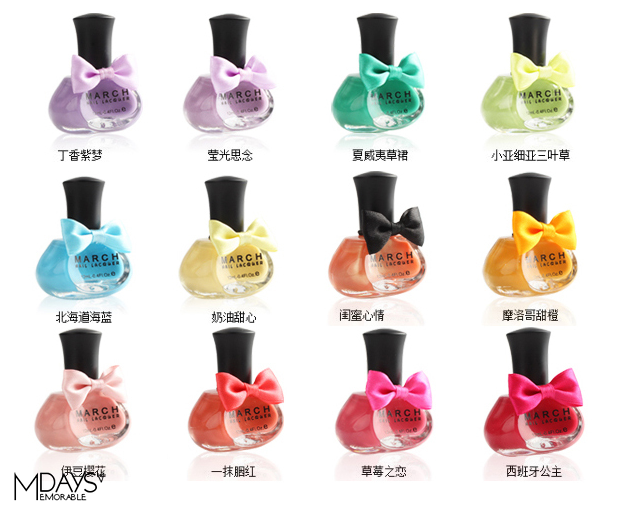 These nail polishes from MARCH are created in Hong Kong and they come in 12 colors. You can purchase all colors at Bornprettystore.com (link to the product) for $7.29 each and there is 12 ml of product in it. You can use my coupon code: MDJ61 to get 10% OFF! I love all colors and i can't wait to collect them all! I only applied a base coat and 2 layers of this nail polish on my nails. It has a glossy finish which I adore. It wasn't streaky and it stayed on my nails for 2-3 days without a top coat. It probably would stay longer on my nails if I applied a top coat afterwards. I'm totally in love with these nail polishes! 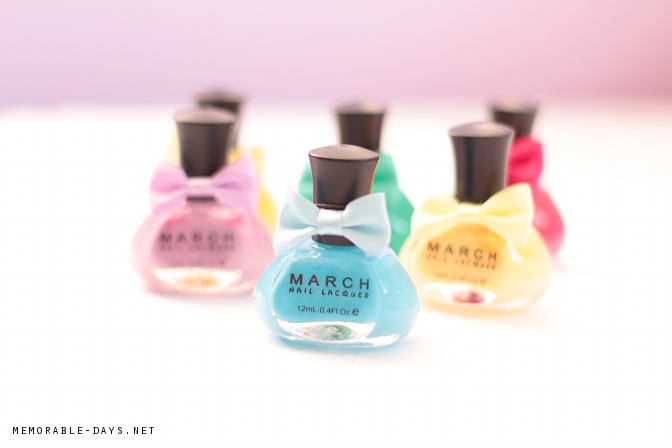 The quality is good, it doesn't have a strong nail polish scent, it's affordable and the bottle is super duper cute! Would you like to purchase these nail polishes? Go to Bornprettystore.com and use my coupon code: MDJ61 to get 10% OFF. note: this product is send to me for review purposes and this blogpost contains affiliate links.